This post should have been online yesterday as I plan to post at least once a week, but unfortunately my children fell ill and they needed my attention. Luckily both are now back to health and so I have found the time to finish this post and put it online. 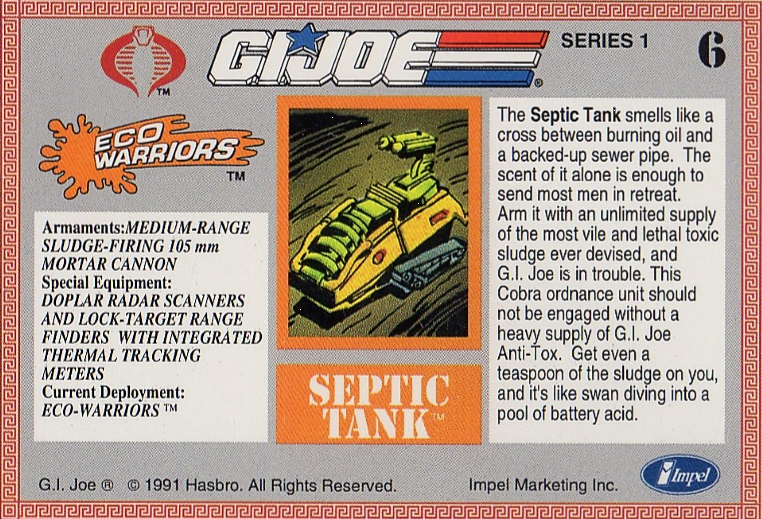 This week, we leave the ECO-Warriors behind us and continue with one of the most iconic G.I.Joe vehicles of all time. 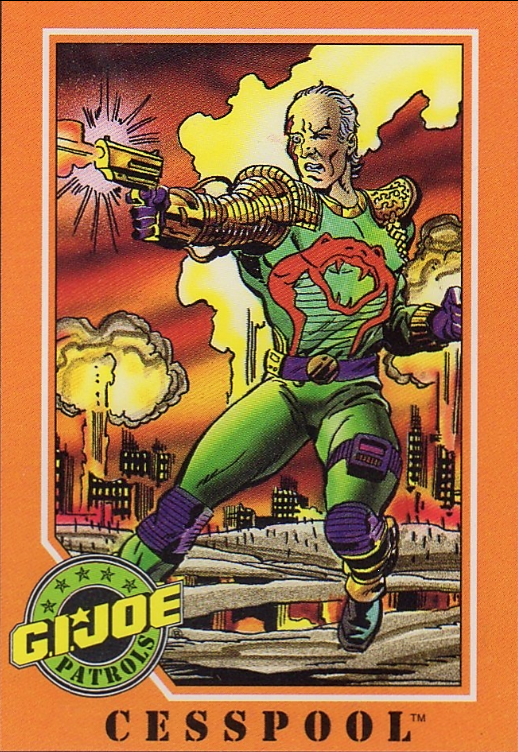 I present to you Card #8 in the 1991 Impel G.I.Joe Trading Card set. The Skystriker was first released in 1983, with it’s pilot Ace. While many other vehicles are rather future-tech oriented, Hasbro built the Skystriker as an F-14 clone, looking exactly like the famous jet fighter. That’s probably why the Skystriker is a huge fan favorite and also one of my favorite vehicles. I currently have 2 jets in my collection, one in mint and complete condition and one that has seen it’s share of action over the years. I actually have a third plane, but that is called the “Sky Striker” MISB, the 30th anniversary version released in 2011. 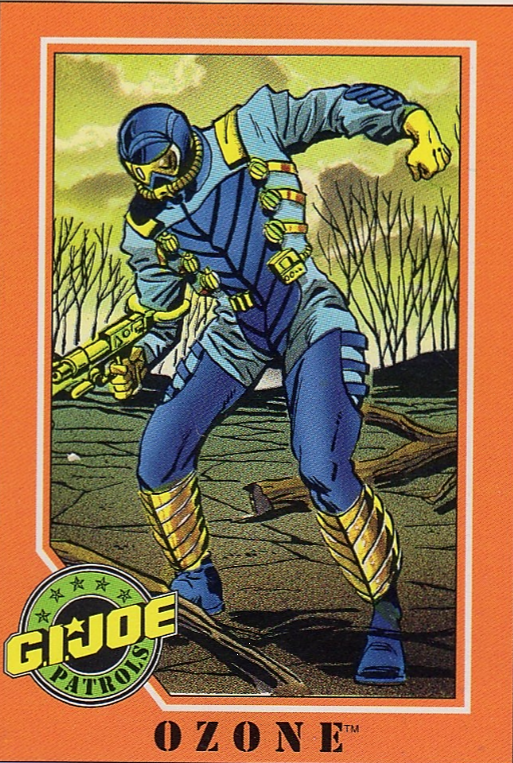 The card art for the Skystriker depict it in a battle with a Cobra Rattler, which the Skystriker won, duh. A lot of the decals that are on the toy are not shown or visible on the art. The most striking decal on the plane is the red globe with the eagle that is located on the tail sections. 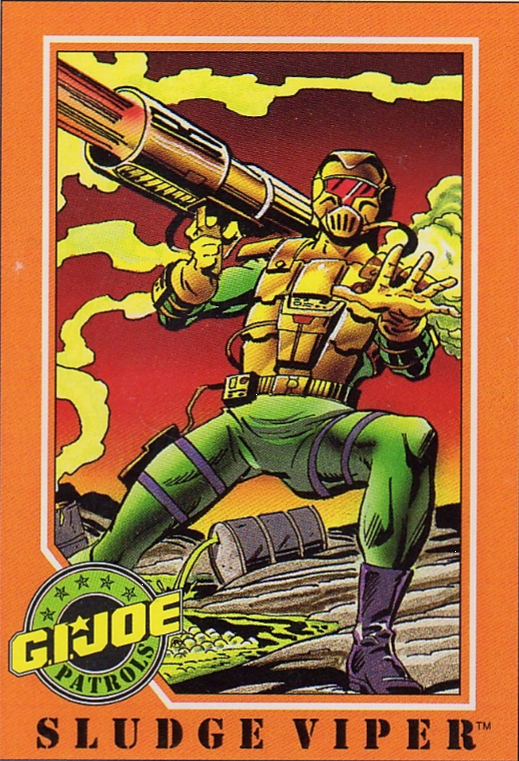 In Belgium, the official G.I.Joe fan club organised a mail-away offer. For 9 Flagpoints and the equivalent of €1 in stamps, you could receive a sew on patch with the Skystriker logo on it. 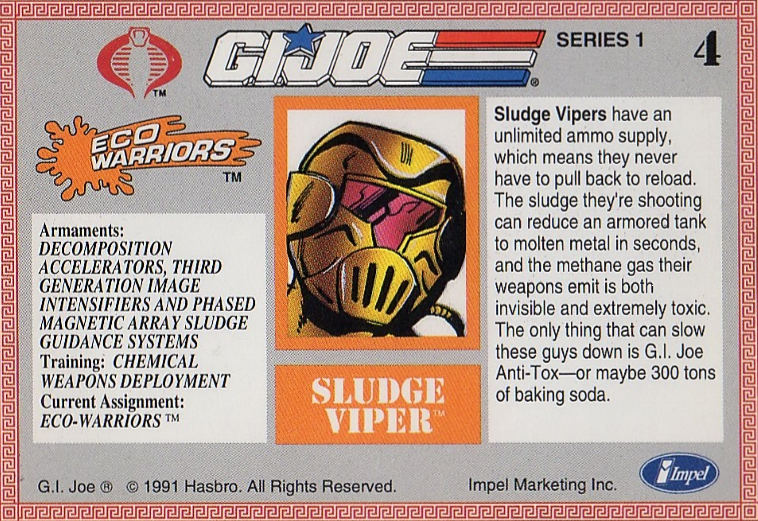 Card number 4 in the series is the Sludge Viper. Producing methane gas is the final step in the decomposition of biomass. So does this mean that the Sludge Vipers are decomposing inside their suit or are they just farting a lot in there? To have an unlimited ammo supply, Cobra chefs must have created the ultimate union soup with beans and Cobra Cola especially for these Vipers. 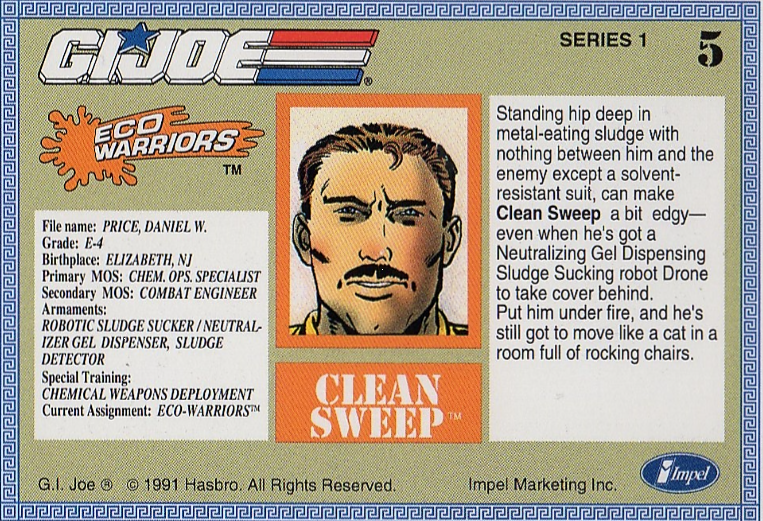 Next up is Clean Sweep. 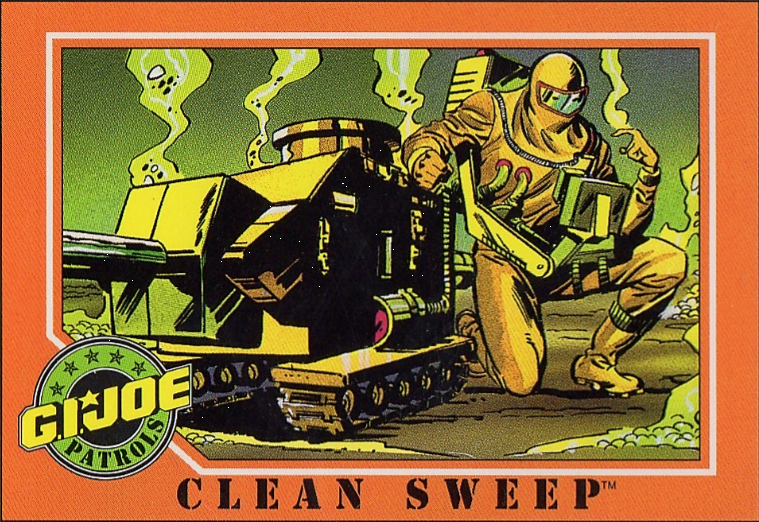 Originally Clean Sweep was designated to be Anti-Tox. The action figure comes with a water shooting robot and has parts of color-changing paint that – uh – changes color whet it gets wet. The figure also came with one of the most impressive mustaches ever to be found on an action figure. Who said Nigel Mansell? Also, can anyone tell me how you move like a cat in a room full of rocking chairs? Card numer 6 is up, the Cobra Septic Tank. 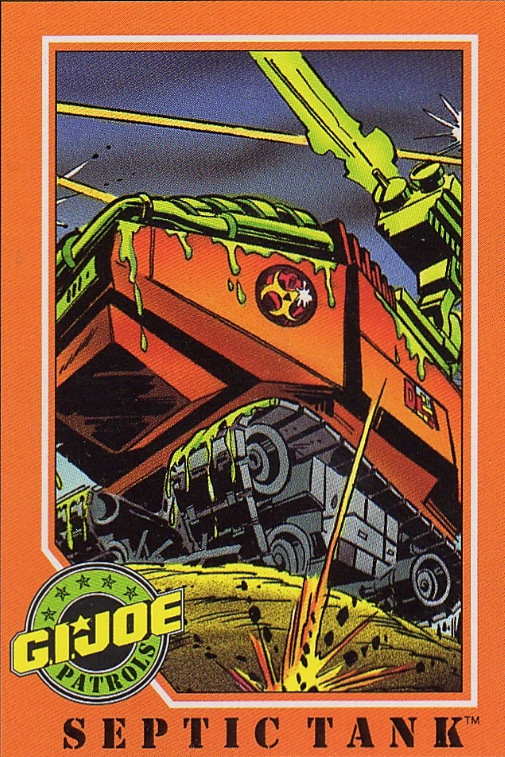 The anti-ECO equivalent of the HISS tank has an unlimited supply of sludge to fire at the Joes. I guess there are a lot of Sludge Vipers in the back enjoying their Cobra Soup… I could make some jokes on the Pit and a the Septic Tank, but let’s not get into that. Fact is that although this Eco-Warriors series is very colorful and is sometimes frowned upon by the collectors, I like the design of the tank and think it works great in the setting. Okay, time for card 7. Here is Ozone. I’m kinda missing the ninja of the team. 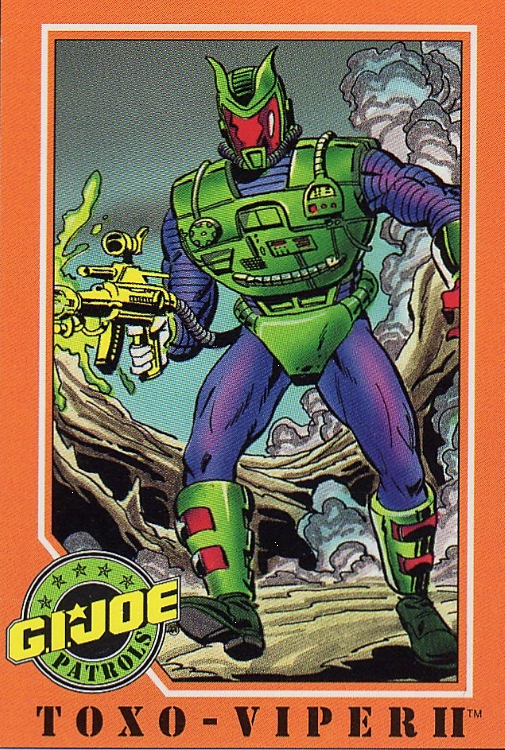 But hey, at least Ozone got to be an astronaut on the next sub-team of the Joes, the Star Brigade. 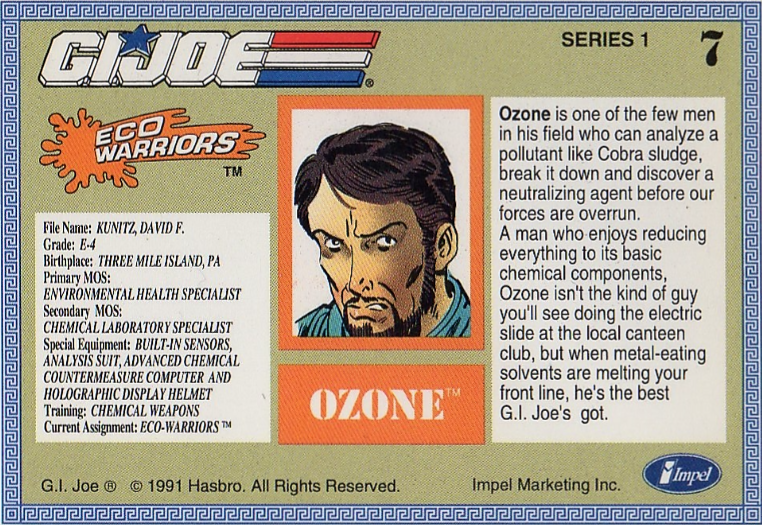 As they did with Cesspool, and with a few other characters, Ozone was named after David Kunitz, a member of the G.I. 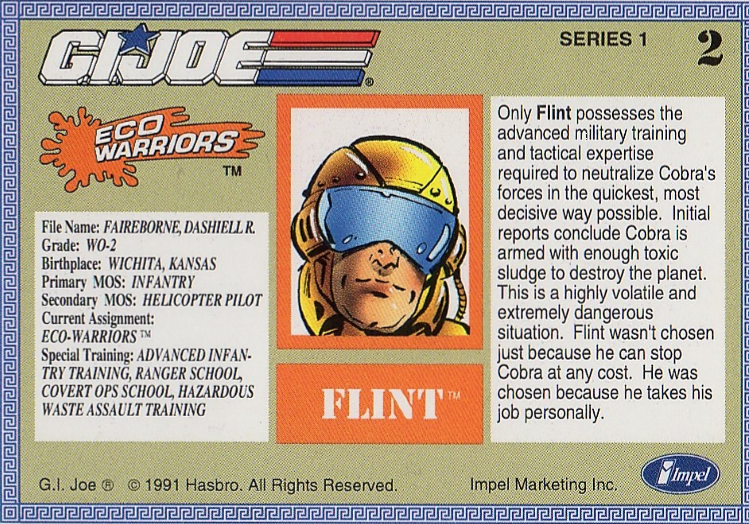 Joe design team working for Hasbro at the time of this figure’s release. 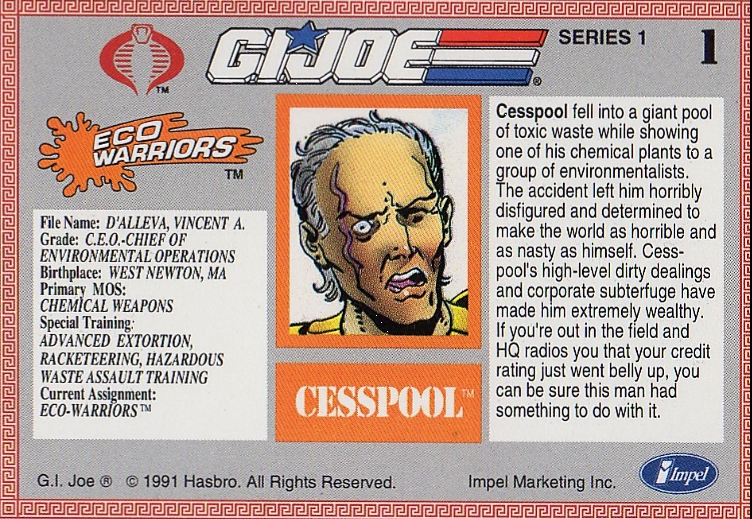 All in all, the Eco Warriors are a colorful bunch that heralded the nineties G.I.Joe line and defined the rest of the line. The wacky colors, strange accessories and just plain weird stuff. But hey, if you’re a fan, you stick by. For better or worse, through Sludge and Monstro-Vipers, till the DEF and Ninja Force comes and beyond. Oh and the Mega Marines. Anyway, feel free to link this page to friends and family, heck even to people you don’t really like. If you have suggestions or remarks, leave a comment below or tweet me @EuropeanJoes. A few years ago (when the USD-EUR exchange rate and the shipping costs were still favorable) I happened to purchase some G.I. Joe figures from a web shop I can’t remember. Anyway, while browsing for other bargains, I encountered the 2004 Wizard of the Coast’s G.I. Joe Trading Card Game Starter Pack and booster packs. 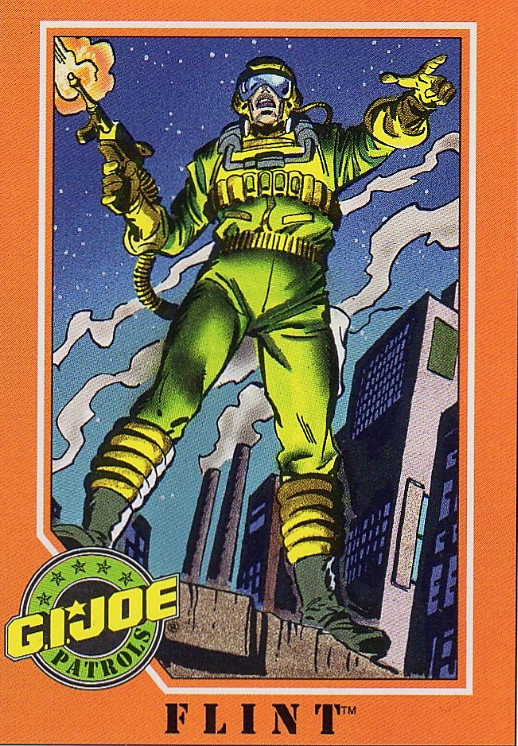 Having played my share of Magic: The Gathering, I was drawn to the idea of playing a card game featuring the Joes and Cobra’s. So I ended up buying 2 Starter Packs and several booster packs, both from the first series and the Armored Strike Expansion Set. 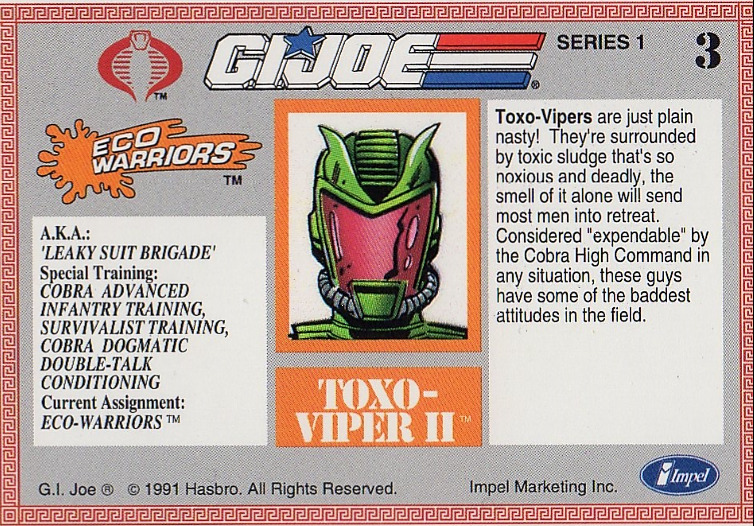 I still had my Ultra-Pro binder and inserts and soon my Magic cards were replaced by the G.I.Joe cards. I have recently been trying to expand my collection again (New Year’s resolutions and all) and completing my Trading Cards is high up on the priority list. I have purchased the 1987 Comic Images set and the 2013 Retaliation set (I know, Retaliation, but hey, I said I have a big collector spirit). Okay, so after this somewhat long introduction… THE NEWS! I will post and discuss all the Trading Cards I have in my collection, starting with the Impel set. I’ll launch a post about the cards about once a week, maybe more if this picks up some audience. So spread the word and follow my blog! For now, happy collecting and YoJoe! I’ve been trying to complete my G.I. Joe Trading cards and have succeeded in buying a complete set of the 1994 30th Salute set. For the 2004 Wizards set, I’m still missing quite a few cards. I’ll list them here below, should you (or someone you know) have any lying around, just let me know and maybe we can make a deal. Happy Collecting and Yo Joe!